A larger battery, beefier CPU, and other goodies let it run longer and faster. Unlike its predecessor, the Yoga 900’s isn’t trying to be the slimmest reversible laptop around. 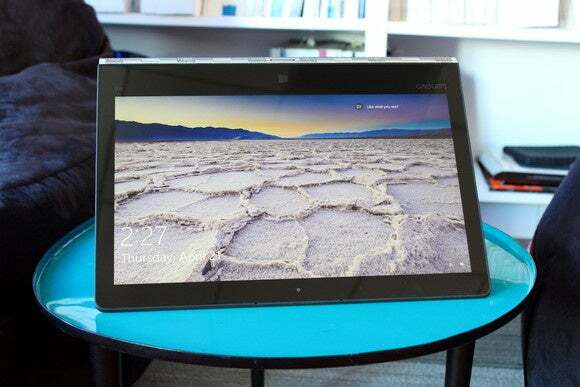 It’s 18 percent thicker than the Yoga 3 Pro to accommodate a more powerful Intel Core i5 or i7 processor—the Pro used a Core M chip—and the larger battery and additional cooling it requires. 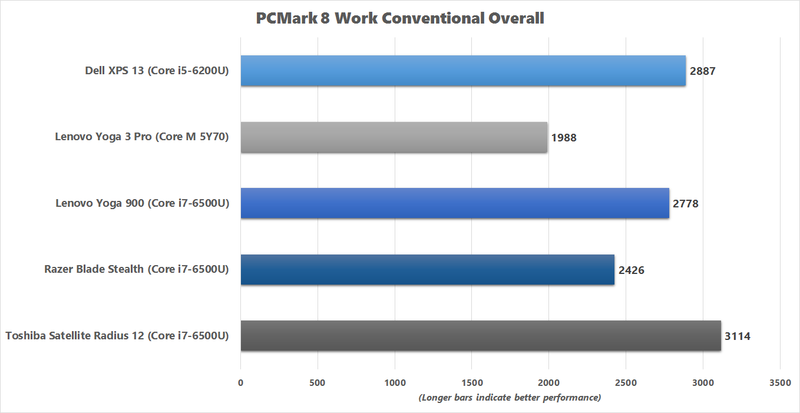 That means considerably better performance and a longer runtime. Those are improvements that no one will complain about, unless they prefer a skinny machine. 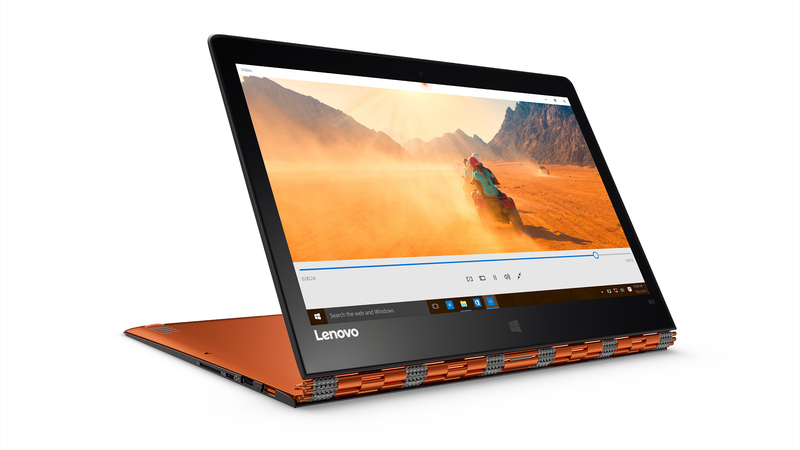 The Yoga 900 starts at $1,150 and is available from Best Buy and Lenovo. 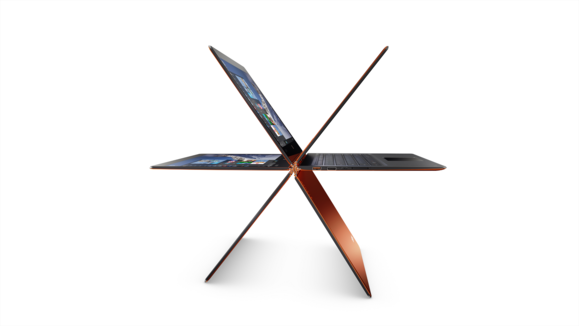 That said, Lenovo claims that the Yoga 900 is the thinnest Core laptop on the market. That may well be, but at 0.59 inches thick and 2.8 pounds, it’s still bigger than the older 0.5-inch, 2.6-pound Yoga 3 Pro. However, with its slightly reduced depth (8.86 inches versus 9 inches) and width (12.75 inches versus 13 inches), the Yoga 900 has crossed over into looking somewhat generic due to its squatter profile. While an 18-percent increase sounds like a lot, the extra thickness isn’t all that much. But though I prefer the look of the Yoga 3 Pro, the Yoga 900 is an attractive laptop, especially since it also boasts the Yoga line’s fancy watchband hinge. It’s too bad that motif isn’t applied subtly to the rest of the laptop, but if you want to turn heads, you can always opt for the Clementine Orange color. The now famous watchband hinge on the Clementine Orange model Yoga 900. The Yoga 900 is a fully reversible laptop with a 13.3-inch, 3200x1800 IPS touchscreen display. Its picture is great under most circumstances, especially playing movies in low-light conditions, and has a decent amount of brightness. On the minus side, the screen reflects quite a bit of light, and it has a rather healthy amount of bezel. It’s hard not to want something sleeker after the example set by Dell’s XPS 13. The port selection on the Yoga 900 is minimal but adequate for everyday use. You get two USB 3.0 Type A ports, a USB 2.0 charging port, an SD/MMC card reader, combo analog audio jack, and a USB Type C port. That Type C gives you standard USB 3.0 (5Gbps) speeds. It doesn’t support Thunderbolt 3, nor charging. You don’t get a dedicated video-out port, but the Type-C port provides DisplayPort over USB if you use an optional dongle. 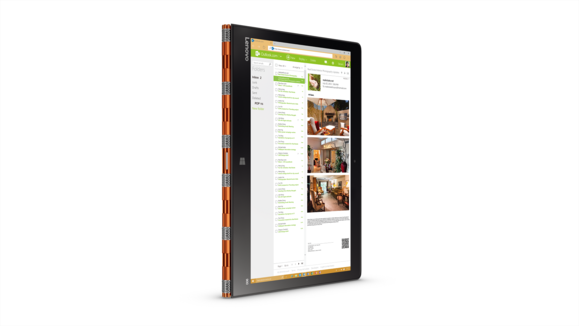 The Yoga 900 in tablet mode. The Yoga 900 is available with an Intel Core i7-6500U CPU, a 256GB or 512GB SSD, and up to 16GB of DDR3-1600 memory. All versions come with 802.11ac Wi-Fi and Bluetooth 4.0. Our $1,400 model had its specs maxed out, while the minimal Core i7 configuration runs $1,150. With a faster CPU, it was no surprise that our Yoga 900 zipped past its predecessor in our PCMark benchmarks, scoring 2,531 versus the Yoga 3 Pro’s 1,723 in the Home Conventional test, which runs the system through basic tasks like word processing, web browsing, and light photo editing. It also scored 2,778 versus the Yoga 3 Pro’s 1,988 in the Work Conventional test, which is similar to the Home Conventional test but with a stronger focus on work-oriented tasks like spreadsheet editing. 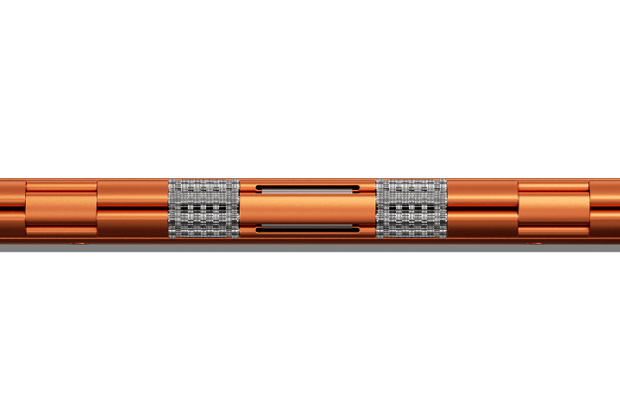 This improvement in performance will show more clearly the more you throw at the Yoga 900. 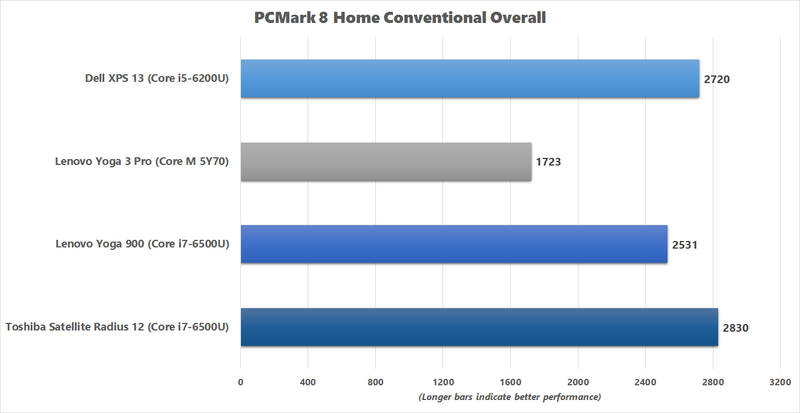 While the Yoga 900 smokes the Yoga 3 Pro, it does slightly underperform competition with the exact same processor. That said, the difference is so small you won’t really notice it. The Yoga 900’s SSD keeps things moving along quickly. Our AS SSD benchmark clocked the Samsung SM871 M.2 SATA SSD at a high of 473MBps for sequential read speed and a high of 437MBps for sequential write speed. That’s decently quick, if not as fast as an M.2 PCIe SSD would have been in the same scenario. Battery life is decent, even if it’s not the nine hours Lenovo touts. The Yoga 900 lasted 6 hours and 37 minutes during our video rundown test, in which we run a 4K ultra-HD video on loop using the native Windows 10 media player. Thanks to the Yoga 900’s larger 66WHr battery, that’s almost 50 percent longer than the Yoga 3 Pro, with its 44.8WHr power cell. As for watching movies with the sound going through the laptop speakers—you get a surprisingly decent experience that way. No one will mix their next album using the Yoga 900’s speakers, but the clarity is better than average, and there’s even a modicum of bass. They’ll do if you’re too lazy to pull out your headphones. The Yoga 900 in reverse-stand mode. I’ve generally praised Lenovo for its keyboards, and the Yoga 900’s is about as good as it gets. It even offers dedicated functions keys—the Yoga 3 Pro instead had combined them with the top-row numeric keys. I do have a personal issue with the lack of forward rake to the unit and the keyboard deck, because I encounter lots of accidents with the space bar. That’s easily fixed with a couple of self-adhesive rubber feet for the rear of the Yoga to add the incline that I need, though. The Yoga 900 in normal laptop orientation. The touchpad feels very comfortable to use: It doesn’t require much effort to click, and it’s very smooth when dragging your fingers across it. It also isn’t overly sensitive to tapping. As for the touchscreen, I can’t speak highly enough of it. I wish they made touchpads that were as smoothly responsive. There was a fair amount of “value-added” software running in the Windows 10 Home system tray, a lot of it courtesy of Intel. Removing it (hint: remove then re-install the Intel drivers using Device Manager) as well as McAfee made for a slightly smoother experience. 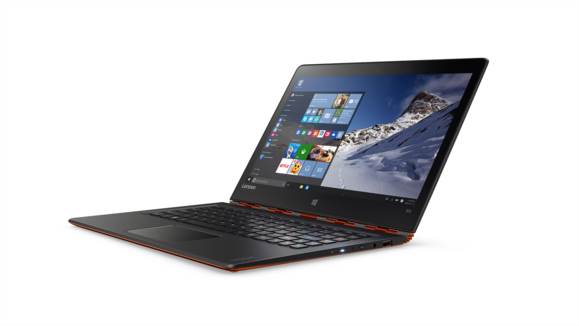 The base warranty on the Lenovo Yoga 3 900 is a one-year carry-in. You can increase that all the way to three years with accidental damage protection for $219, or pick an option in the middle. The Yoga 900 is a fully reversible laptop with a great 13.3-inch, 3200x1800 display and a handsome watchband hinge. 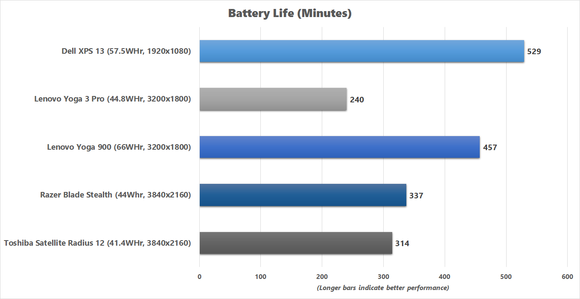 Performance is greatly improved over the preceding Yoga 3 Pro, as is battery life, but this newer model is a little thicker and heavier.